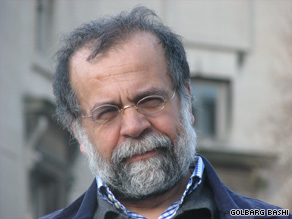 Hamid Dabashi says millions of Iranians are now convinced the election was rigged. (CNN) -- In a recent article published both in the Washington Post and the Guardian, Ken Ballen and Patrick Doherty reported that according to their "nationwide public opinion survey of Iranians three weeks before the vote ... Ahmadinejad [was] leading by a more than 2-to-1 margin -- greater than his actual apparent margin of victory in Friday's election." That may or may not be the case, but the abiding wisdom of Aesop's fable of "The Boy Who Cried Wolf" or its Persian version, "The Lying Shepherd," has now made any such Monday-morning quarterbacking an academic exercise in futility. The assumption that the government has rigged the election has become a "social fact" that millions of Iranians believe. On the basis of that belief, they have put their lives on the line, with reported casualties of dozens injured and at least one, perhaps up to nine, people killed. Chief among the slogans of supporters of presidential challenger Mir Hossein Moussavi is "With God's help victory is at hand/Death to this deceitful government!" Such a significant and sizeable segment of Iranian society has lost its trust in this regime in general, and in Mahmoud Ahmadinejad's presidency in particular, that even if this time around the authorities are telling the truth, they have cried wolf too many times to be trusted. What we are witnessing is a pent-up anger some 30 years in the making, from the very first inception of the Islamic revolution. The inner contradictions of an Islamic republic seem finally to have caught up with it. What is unraveling in Iran is not a mere reaction to the result of a presidential election, the tabulation of which may or may not have been accurate. We must place this massive outpouring of pro-Moussavi, anti-Ahmadinejad sentiments among a sizeable segment of Iranian population in a larger context. At least since the presidential election of 1997, which resulted in the presidency of Mohammad Khatami, but with its roots in even deeper sentiments, a vast cross-section of the society has continuously demonstrated its dissatisfaction with the Islamic republic. Soon after the election of President Khatami, in summer 1999, a major student uprising led to yet another massive movement against the government, at a time, in fact, that an exceedingly popular reformist president was leading the country. Immediately after the tragic events of September 11 in the United States, a sizable group of Iranian youth were rare among Muslim countries in organizing a candlelight vigil commemorating the victims of 9/11 in evident and obvious defiance of their government. Even beyond these sporadic or symbolic events, we have a far more sustained record of inborn and grassroots movements in Iran for human rights, civil rights and above all, women's rights, which in many instances have taken the very tenets of the Islamic republic to task. It would of course be a misrepresentation of Iranian society to presume that the regime in general or Ahmadinejad's government in particular lacks any degree of popular support or legitimacy. Iran is a society that is deeply fractured along class, social and gender lines. The day after the initial demonstrations against Ahmadinejad, his supporters staged a major rally on his behalf. To be sure, these are state-sponsored, well-orchestrated and carefully staged events, widely broadcast on national TV to fabricate the impression of a far more massive support than he actually enjoys. But nevertheless they do represent a significant segment of the society, as well. What we are witnessing since the presidential election might very well emerge as a major civil disobedience movement not just against Ahmadinejad, but in fact for more civil liberties, economic opportunities, as well as human, civil and women's rights -- so far all within the constitutional boundaries of the Islamic republic. But this may in fact extend to target the nondemocratic institutions within the republic, such as the office of the supreme leader and that of the Guardian Council. The militant supporters of the regime are of course wary of the movement and think it a "velvet revolution." They have warned that they will nip it in the bud. There is already an evident discrepancy between the deep-rooted demands of the movement that this election has unleashed and what Moussavi or the entire reformist movement can actually deliver. In the days and weeks ahead, we will have to wait and see how the dialectic between Moussavi and the volcano he has unleashed will work itself out, but it is false to think that he is all that this movement wants, or that he is in complete control of the movement, or that the ruling clergy will just pack and leave like the shah did. Moussavi himself has quite a number of nasty skeletons in his closet from his years as the prime minister during the Iran-Iraq War (1980-1988), with his brutal suppression of dissident movements, ideological purging of the universities and so on. He and his wife, Zahra Rahnavard, are indeed emerging as widely popular among a significant constituency. But that does not mean that this social unrest is just about him. The only thing that is crystal clear: Out of a population of 72 million and a total of 46 million eligible voters, some 40 million, upward of 80 percent, voted in this election, and a significant segment of them are against the draconian doctrine and policies of the Islamic republic, the economic calamities (double-digit inflation and endemic unemployment) of Ahmadinejad's domestic policies and his belligerent positions on a range of issues, from the inanities of his denial of the Holocaust to his vacuous and flamboyant positions on a number of regional issues. Neither can the world at large disregard that collective democratic will and have the delusion of a regime change imposed from outside; nor can it be brushed aside by the future president of the Islamic republic, whoever he might be, legitimate or illegitimate. As Grand Ayatollah Montazeri has just said, this movement is challenging the very legitimacy of the Islamic republic. That the elections might or might not have been rigged is now a completely moot and irrelevant question.